A special edition of Jaguar's all-wheel drive X-TYPE compact sports saloon is unveiled at the British International Motor Show in Birmingham. The enhanced specification of the 'Indianapolis' emphasises Jaguar's stylish design and the sporting driving characteristics of the X-TYPE. Taking its name from distinctive 18 inch Indianapolis R Performance BBS alloy wheels, this exclusive X-TYPE is available in a choice of three paint colours, Ebony, Platinum and new Ultraviolet blue. Alcantara-trimmed, black sport seats and a unique facia veneer are highlights of the interior styling. Maintaining Jaguar's philosophy of combining performance, innovation, craftsmanship and luxury with outstanding value for money, the X-TYPE Indianapolis also features as standard, high-intensity Xenon headlights, electric rear windows, automatic air conditioning and ultrasonic reverse park control. Two versions will be offered, a 194bhp 2.5 litre V6 and a 231bhp 3.0 litre V6. The best-in-class specific power of these engines translates to 0-60mph in 7.9 seconds and a top speed of 140 mph for the 2.5 litre and 6.6 seconds and 146mph respectively for the 3.0 litre. A five-speed manual gearbox is standard, with an electronic five speed automatic transmission available as an option. A key strength of he Jaguar X-TYPE is its Traction-4 full-time all-wheel drive system. Directing 40 percent of the engine's driving torque to he front wheels and 60 percent to the rear, Traction-4 helps maintain optimum tyre grip for control and reassurance in all weathers. But conditions do not have to be hazardous for Traction-4 to come in to its own. In he dry, on a fast, winding road, the X-TYPE's agility, poise and balance will reward he most enthusiastic of drivers. Since its launch in May 2001, the Jaguar X-TYPE has attracted a significant number of new customers, many of whom previously may have regarded a Jaguar as beyond their reach. Delivering practicality as well as performance and style, the X-TYPE is at the vanguard of Jaguar's thrust to broaden its appeal across a more diverse customer base, including an increased number of user-chooser company car drivers. 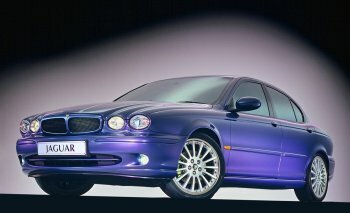 The Jaguar X-TYPE Indianapolis will be available from January 2003, priced at £27,500 for the 2.5 litre V6 and £29,000 for the 3.0 litre V6.